Notification with the passing of Northwest/Delta pilot Captain Bruce Philip Eaton, age 64. Captain Eaton joined Northwest Airlines 02-22-1985. He is survived by his children and had most recently resided in Cocoa Beach, Florida. Captain Eaton’s obituary indicates that memorial services were held in Cocoa Beach. Born December 28, 1952, passed away on April 20th, after a hard fought battle with cancer. An avid flier, he served in the military as a Naval aviator, where he attained the rank of Commander. 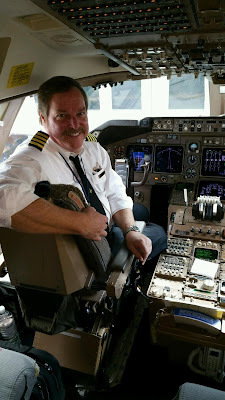 He enjoyed 32 years as a Captain for both Northwest and Delta Airlines. He is survived by his three children, Nickolaus, Cassandra and Valmund, as well as father Merv, sisters Kathleen and Laura and brother Douglas. Bruce was a man who embraced life, and lived every moment to the fullest. He had a heart of gold and will be sorely missed. A memorial service was held in Cocoa Beach Florida.
. Published in Dayton Daily News on May 10, 2017.